'We condemn in the strongest possible terms this egregious display of hatred, bigotry, and violence on many sides — on many sides,"
The year was 2017 when the Charlottesville violence happened, when White Supremacists – supporters of Ku Klux Klan or KKK – killed a young man and wounded several others, by ramming a car into a rally of counter protesters. What had further shocked people was that instead of condemning this planned, one-sided violence, President Donald Trump had tried to 'discover' equivalence by talking about 'violence on many sides' for which he received enough opprobrium. Yes, there was a single Indian politician who had come out in full support of Trump's stand who had urged US-based Indians 'to stand with Trump' when he was being 'hunted by cockeyed liberals and Left wing loonies on racism'. 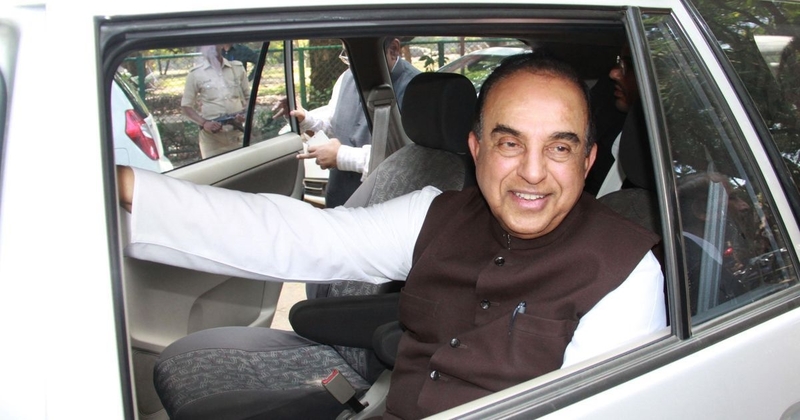 Not a long ago, BJP leader Subramanian Swamy was in the news again when he targeted Priyanka Gandhi, younger sister of Congress President Rahul Gandhi, when she was appointed as the general secretary of the Congress Party. He had alleged that she 'suffers from bipolar disorder and beats up people', and that she was misfit for public life. He had no qualms about thus humiliating the entire community of 'specially abled people', and had exhibited his utter ignorance about the fact that with proper diagnosis and treatment, people with such a disorder can lead healthy and productive lives. Variously described as a political maverick, a 'Muckraker-in-Chief' or a colourful politician, Swamy is in the news once again. A petition has been moved by groups working for 'safeguarding India's pluralist and tolerant ethos' – based in the US – and has been signed by more than 1,700 people of various professions and organisations. It urged the Massachusetts Institute of Technology (MIT) President Rafael Reif to disinvite Swamy, from the MIT India Conference on February 16, 2019 at the MIT Media Lab in Cambridge, MA, and is gathering steam. It underlines how such an invitation can add 'a facade of respectability' to his 'hate and bigotry' and 'in the process denigrate the values of MIT’. It also adds: "[S]wamy’s hateful rhetoric has continued at a time where his party’s rule has been marked by a spate of unrelenting communal violence and lynching of minorities in India. Hateful rhetoric and incendiary speeches like Swamy’s have led to an increase in hate crimes in India by 400% in the past 5 years." The campaign by a group of Harvard students, joined in by hundreds of students, had played an important role in galvanising opinion against Swamy, and had called on the university to terminate its association with him, as it 'seriously compromises the University’s integrity, undermining its commitment to diversity and tolerance'. As noted elsewhere, the said article, which was written in the aftermath of the July 13 bombings in Mumbai, had promoted a vision of Indian society based on Hindu supremacy, and had also cast suspicion on the entire Muslim community. It talked of "declar[ing] India a Hindu Rashtra in which non-Hindus can vote only if they proudly acknowledge that their ancestors were Hindus"; "[r]emov[ing] the masjid in Kashi Vishwanath temple and the 300 masjids at other temple sites"; "[e]nact[ing] a national law prohibiting conversion from Hinduism to any other religion"; and "[p]ropagat[ing] the development of a Hindu mindset". Terrorising and stigmatising a whole community, it added, "Muslims of India are being programmed by a slow reactive process to become radical and thus slide into suicide against Hindus." New Zealand has shown the world how a civilised country responds to a terror attack.